David Teece spoke at this second annual forum, which was jointly sponsored by mLab and Haier Group. This year’s theme was “An Interstellar Ecosystem for Mutual Benefit and Coexistence.” Steven Shi from BRG’s Beijing office also attended the event. 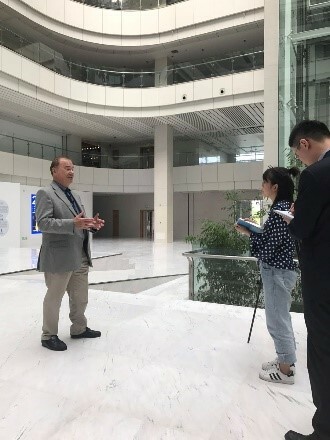 During the three-day visit, David met with Zhang Ruimin, CEO of Haier Group, and Zhang expressed his admiration for David’s academic achievements, particularly over the organizational theory of “dynamic capabilities.” According to Zhang, David’s theory inspired him in 2005 to come up with the “Rendanheyi” business model, which features dynamic management improvements and renovation and is considered a guiding philosophy for Haier Group. On 20 September, David delivered a speech on “Dynamic Capabilities and Rendanheyi” to elaborate the inherent connections between his theory and Zhang’s, as well as their respective applications in practice. Over 1,200 senior professionals from the international academic and business communities attended the event. Other speakers included Dr. Gary Hamel from London Business School and Prof. Rosabeth Moss Kanter from Harvard Business School. Although it was David’s first academic event in China, David and dynamic capabilities have a high profile in the local business community. Haier Group is a consumer electronics and home appliances company headquartered in Qingdao, China. With global sales over $US 35 billion in 2017, Haier Group is the world’s largest white appliance company by market shares. Since 2011, it has acquired shareholdings in leading global white appliances makers, such as Japanese Sanyo, Fisher & Paykel in New Zealand, and GE Appliances in the US. Having been the leader of Haier Group for more than three decades, Zhang Ruimin is a renowned business leader in China for building the white appliance giant and for inventing the “Rendanheyi” business model.